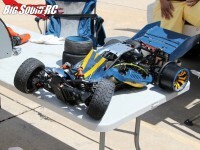 RC Speed Run « Big Squid RC – RC Car and Truck News, Reviews, Videos, and More! You are browsing the "RC Speed Run" category archive. Get ready for the Ultimate Speed Run! Popular Science writes about R/C speed run cars! Popular Science has a spectacular story on a couple of R/C speed demons. This includes Nic Case’s 161 mph Schumacher Mi3, Gary O’Connor’s 4 Engine 93 mph monster, Jack Cecil’s 111 mph Traxxas 4-tec and Nick Maslowski’s 97 mph modified RC10L4 dubbed the “X2”. Check it out here. RC Speed Run Event – Insane Speed Run!